The 2019 Academy Awards have come and gone and unsurprisingly, they were pretty gay. Not “queer person winning an Oscar for playing a queer character” gay, but “Lady Gaga winning her first Oscar” gay, which is still pretty gay! With no host to guide the evening, the night could have gone wildly off-the-rails, but instead things ran relatively smoothly and the show was altogether fun, with most of the trophies being awarded as expected — aside from one of two shocking (and gay!) upsets. Before the Oscars even began, Billy Porter had undisputedly won the night in his Christian Siriano tuxedo gown. The look wasn’t merely a fashion statement but what seems to be an homage to the late Hector Xtravaganza, who consulted on Pose. Legends stanning legends! Wearing Margot Robbie’s Mary Queen of Scots wig, best actress nominee Melissa McCarthy channeled Olivia Colman’s Queen Anne, bunnies included. Black Panther’s Ruth E. Carter became the first black person to win Best Costume Design for her work on Marvel juggernaut Black Panther. In her acceptance speech, Carter dedicated her win to Spike Lee. "I hope this makes you proud," she said. "Marvel may have created the first black superhero, but through costume design, we turned him into an African king...It's been my life's honor to create costumes. Thank you to the Academy, thank you for honoring African royalty, and the empowered way women can look and lead on screen." 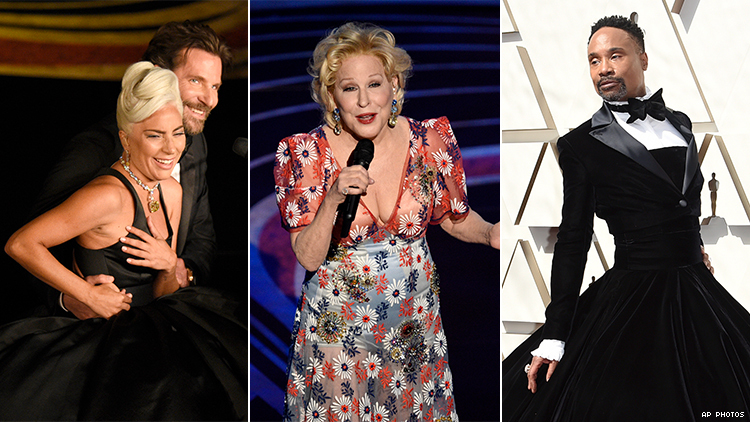 Mary Poppins was largely shut out from the major categories at this year’s Oscars — justice for Emily Blunt — but emotional ballad “Where the Lost Things Go” was thrown a nod for best original song, and in an extremely gay turn of events, Bette Midler performed the song live during the ceremony. With absolutely no introduction, Lady Gaga and Bradley Cooper ascended to the stage from the audience and launched into their runaway smash hit “Shallow” from A Star Is Born. It was a near perfect performance, although the lighting and glare from the piano had them looking like Coco Montrese had done their makeup. Still, Gaga’s final warble left queers everywhere speechless. “If you are at home and you're sitting on your couch and you're watching this right now, all I have to say is that this is hard work,” Gaga said as she accepted her first Oscar for “Shallow” from A Star Is Born. “It's not about winning, but what it's about is not giving up. It's not about how many times you get rejected or fall down or you're beaten up. It's about how many times you stand up and you're brave and you keep going.” Tea. In a turn of events almost no one saw coming, Olivia Colman took home one of the night’s top prizes for her role as lesbian rabbit enthusiast Queen Anne in The Favourite, giving an adorably frazzled acceptance speech in which she thanked her love interests, Emma Stone and Rachel Weisz, Glenn Close, and Lady Gaga. Colman said winning was “genuinely quite stressful. This is hilarious...I got an Oscar!” We have decided to stan forever.